Europe launched a sleek new space plane more than 250 miles above Earth on Wednesday, testing its maneuverability, on-board guidance systems, and a next-generation heat shield as the experimental vehicle glided through the atmosphere toward a pinpoint splashdown in the Pacific Ocean. 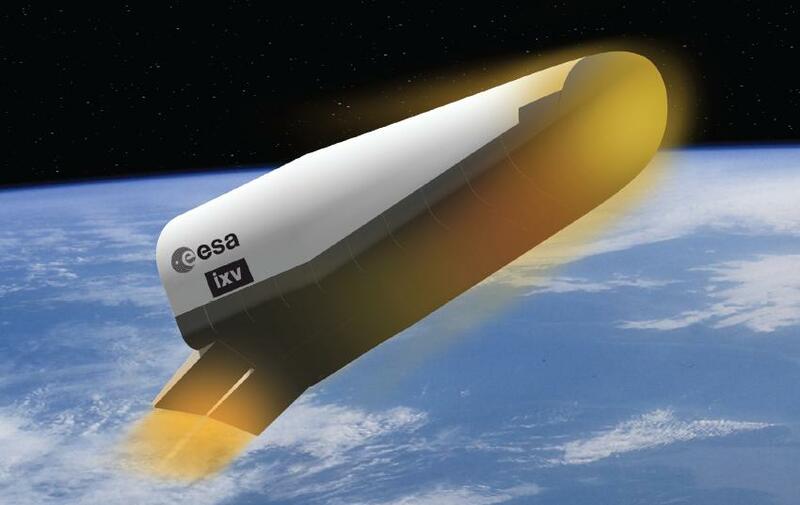 The test flight marked new territory for Europe and in hypersonic research, laying the foundation for plans to develop a robotic mini-shuttle and reusable launcher stages in the future. 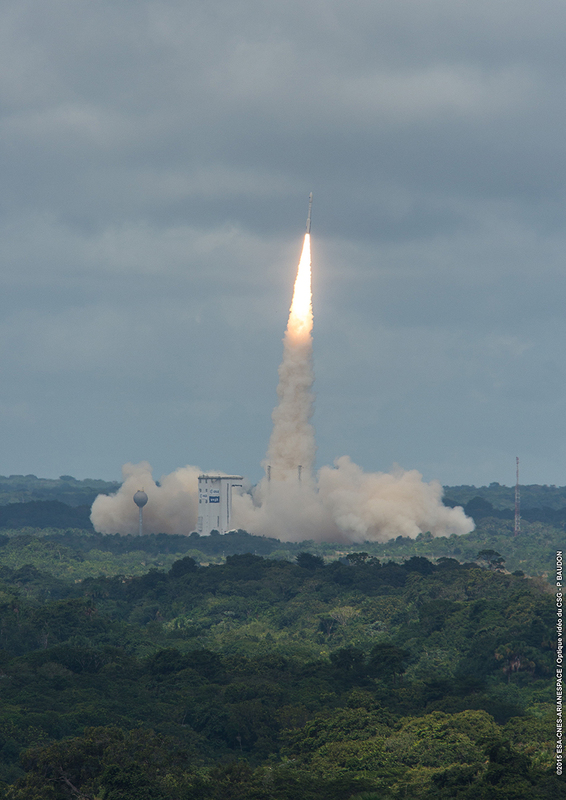 The flight lasted about 100 minutes from liftoff to landing, beginning with a fiery blastoff aboard a Vega launcher at 1340 GMT (8:40 a.m. EST) from the European-run Guiana Space Center on the northern coast of South America. The four-stage rocket flew east from its launch pad, spanning the Atlantic Ocean as it shed its powerful P80 solid-fueled composite motor and two smaller upper stage motors. A Ukrainian-made liquid-fueled engine accelerated the Intermediate Experimental Vehicle to nearly the speed required to achieve orbit, then released the spacecraft more than 200 miles above Earth. The IXV passed above ground stations in Africa, radioing its status back to engineers as it reached the top of an arcing suborbital trajectory at an altitude of about 256 miles (413 kilometers). Steered by four hydrazine rocket thrusters and two aerodynamic flaps, the IXV dropped into the atmosphere, withstood temperatures near 3,000 degrees Fahrenheit, deployed parachutes and splashed down on target in the Pacific Ocean west of the Galapagos Islands. Giorgio Tumino, ESA’s IXV program manager, called out status reports on the space plane’s descent. The re-entry demonstrator flew out of range of ground communications antennas about a half-hour after liftoff, and the build-up of plasma around the craft during re-entry blocked radio signals. The IXV was programmed to fire thrusters and move its flaps for a series of S-turn banking maneuvers during re-entry, similar to roll reversals executed by space shuttles returning from orbit. Tumino announced the acquisition of signals from the IXV at 1502 GMT (10:02 a.m. EST) after the spacecraft was out of the most stressful phase of re-entry. A supersonic parachute deployed a few minutes later as the IXV flew at Mach 1.5, then a drogue stabilizing chute ejected before the ship’s 100-foot (30-meter) diameter main parachute unfurled to slow its speed to about 15 mph. 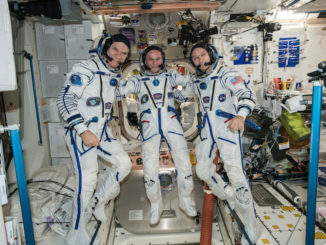 Officials declared splashdown at 1519 GMT (10:19 a.m. EST), wrapping up a 20,000-mile around-the-world journey. More than 300 sensors — strain gauges, pressure and temperature instruments, accelerometers, and an infrared camera — were aboard the IXV to record data on the space plane’s test flight. The IXV transmitted the data to engineers before it splashed down. The spacecraft’s belly is covered in black ceramic matrix thermal protection panels — made of a mixture of carbon fiber and silicon carbide — bolted to the IXV’s structure. Cork-based and silicon-based ablative light-colored materials blanket the space plane’s upper surfaces. Once recovery teams retrieve the spacecraft — which measures about the size of a family car — it will be returned to Europe for inspections. European engineers are in the early stages of developing a follow-on automated space plane — called the Program for Reusable In-orbit Demonstrator for Europe, or PRICE — that would launch on a Vega rocket into orbit, perform research and deploy or retrieve satellites, and return to Earth for landing on a runway. The PRIDE program won funding from ESA member states in 2012 and 2014 for initial studies, but the new space plane needs more money to fly by 2020, as hoped by its backers. Officials said lessons learned from Wednesday’s IXV test flight will also aid work on other projects. “This mission will teach us a lot about the technologies we need to apply in new launch systems, in particular when we think about reusable systems,” said Gaele Winters, director of ESA’s launcher directorate. The IXV program — with a cost of about 150 million euros ($170 million) — also has applications in space science and human spaceflight, officials said. Future probes to collect and return samples from other worlds will need an advanced heat shield beyond Europe’s current capabilities, and although Europe has no plans for its own human spaceflight program, such a vehicle would require technologies tested by the IXV. Wednesday’s test mission was the first European re-entry testbed to fly since 1998, when ESA launched a blunt Apollo-like capsule on a ballistic flight around Earth on an Ariane 5 rocket. Development of the IXV began in 2002 with ESA-funded studies, and industrial activities started in 2005. “Europe has leadership in going to orbit,” Tumino said in an interview before Wednesday’s launch. 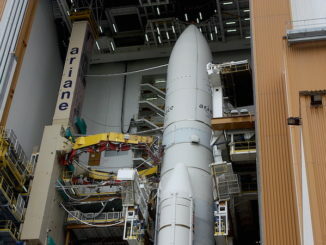 “We have the long history of the Ariane family up to the Ariane 5, and we have also the success of the new Vega launcher. We believe the European know-how in getting to orbit is quite good. We also believe that European competencies in operating advanced systems in space is among the best worldwide, with the ATV (space station supply ship) and the Rosetta mission (to comet 67P/Churyumov-Gerasimenko). The IXV’s shape is a lifting body — blend between capsules like Apollo and winged re-entry vehicles such as the space shuttle. Wingless lifting body vehicles have only been tested in the atmosphere before IXV, officials said. “The novel part of this — and this is the first time worldwide — is we are going to test, in flight for a full re-entry, a lifting body,” Tumino said in a pre-flight interview. Italy is the prime financial supporter for the IXV and the Vega launcher. 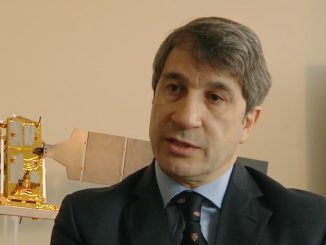 Roberto Battiston, president of the Italian Space Agency, said Italy will push for a more defined re-entry program within Europe’s space program. “What to do next is not easy,” Battiston said in remarks after Wednesday’s mission. “Defining the future takes vision, risk and not being afraid of making a mistake. But clearly, in order to develop re-entry technology, we have to have a re-entry program. Officials said representatives from ESA member states would meet later this year to discuss the prospects for the PRIDE space plane program, and attempt to identify more concrete objectives for the new spaceship. The current concept for PRIDE is for the space plane to be a smaller, civilian-run counterpart to the U.S. Air Force’s X-37B spacecraft, which flies on classified missions and lands on a runway like the space shuttle.